KIT digital has been selected by RCN Television to provide a variety of online video and audio solutions for their television and radio assets. RCN is a wholly owned subsidiary of the Ardila Lülle Organization, a leading regional, diversified conglomerate based in Bogotá, Colombia. KIT digital has contracted with e-nnovva, the recently created new media division of RCN, to provide proprietary technology to host live streaming, video-on-demand, and live audio content in both short and long formats for RCN's network of TV and radio stations. KIT digital's "VX " digital asset management platform will provide RCN with best-of-breed customer-facing functionality as well as wide-ranging capabilities for RCN to proactively create new channels and sub-channels, geo-blocking features, advertising integration, and other interactive marketing programs. Metacafe now enables viewers to personalize their entertainment experiences by adding dialog bubbles, photos, webcam video, clip art, subtitles and more to online videos. These viewers turned co-creators can save their work for the enjoyment of other members of the Metacafe community and can share their personalized clips with friends via e-mail. This creativity toolkit, called PLYfx allows content enrichment web services and tools which enable interactivity and enrichment of web videos. Rapid Fitness has sold all its Media assets to Global TV Network which included the Kid's Music Television Network, IPTV Sports Network and Entertainment Network with its Internet Equipment. Global TV Network has completed the definitive agreements with UC Hub, Inc. regarding Global TV Network sale of its assets and ISP and online content providing portal. While the terms of the sale will remain undisclosed, management stated that shareholders of Rapid Fitness can anticipate a dividend, regulating to the sale, to be announced in the near future. PrimeTel in Cyprus has employed Thunderworx to build its IPTV platform and one year later enjoys the success of its decision. In Cyprus, broadband operators are currently competing to expand their market share by providing a range of advanced new broadband services to their customers. In response to customer demand and the fierce competition in Telecommunications market, PrimeTel decided to offer a range of new triple-play services. That meant that PrimeTel needed to deploy a complete end-to-end platform capable to support an integrated triple-play network for all media, all services and all devices. Limelight has been selected to provide live and on-demand video streaming services to NBCOlympics.com on MSN during the network's coverage of the 2008 Beijing Olympics from Beijing, China, 8-24 August. Limelight Networks is the primary CDN for all video content on the "NBCOlympics.com on MSN" web site, which is being produced in partnership by NBC and MSN. With a global content delivery network, purpose-built to handle high-profile events like the Olympic Games, Limelight Networks will help NBC and Microsoft provide fans with access to approximately 2,200 total hours of live streaming Olympic broadband video coverage and approximately 3,000 hours of highlights, rewinds and encores leveraging a next generation Microsoft Silverlight user experience. While the rest of the consumer electronics and pay-TV worlds are still stuck in more traditional native code environments, the push for online video and social communities in the living room has resulted in ever-increasing interest in HTML and other web-based technologies on consumer TVs. The consumer-usable living room browser market is led by a few companies such as Opera and ACCESS, while other companies such as OpenTV, Oregan Networks and ANT Software are active in selling their browser products as part of a Web-based UI rendering solution. Nokia-owned Trolltech recently integrated Webkit into its “Qt” platform to allow CE developers to create mixed Web and native user interfaces. Lastly, the Consumer Electronics Association has developed the CE-2014 standard that leverages HTML to render user-interfaces in a connected living room, though vendor support for this effort appears limited at this time. 8e6 Technologies released its 8e6 R3000 Internet Filter version 2.1. The major upgrade features expansions to the filter’s Safe Search function adding support to Ask.com and the AOL search engine. Additionally, the release includes increased administration capabilities and introduces several new filtering controls that will aid IT managers in time for the highly Web-accessible Beijing Olympics. For the first time in the United States, Olympic enthusiasts will be able to access live streaming coverage of the Summer Games as it happens. During the Games’ 17-day run, NBCOlympics.com plans to offer 2,200 hours of live streaming video and a total of more than 3,500 hours of exclusive on-demand video. IT managers can expect both a surge of interest in following the games online and unregulated access that could trigger network bandwidth overloads and loss of productivity. While IT administrators may attempt to completely block access to any types of streaming media during this time, total restriction may encourage many to bypass the network filter altogether via Web-based proxies. Widevine has been selected by Netmax.tv to enable secure distribution of targeted, geo-specific programming to a worldwide audience of Hollywood / Bollywood / Worldwide content enthusiasts. By deploying Widevine's security platform Netmax.tv will securely reach Windows, Mac and Linux users running a wide array of Web browsers such as Internet Explorer, Firefox, Safari and Opera, and IPTV set top box users. 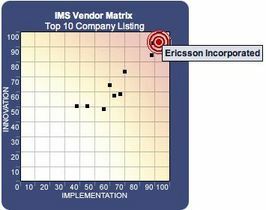 Ericsson ranked at the top of the latest Vendor Matrix released by ABI Research, maintaining the position it held in the last edition of this Matrix. Alcatel-Lucent and Nokia Siemens Networks claimed the second and third spots in the company’s new evaluation of worldwide IP Multimedia Subsystems infrastructure vendors. Alcatel-Lucent showed a stellar rise compared to its #6 rank in the previous Matrix, while Nokia Siemens held its previous position. Vidshadow has selected Limelight Networks to provide content delivery services for VidShadow’s next-generation broadband TV experience. Under the terms of the agreement, VidShadow will utilize the LimelightDELIVER service to distribute targeted, licensed Internet TV programming to Vidshadow’s niche market audience. Limelight Network’s CDN infrastructure provides content providers partnering with Vidshadow with a more sophisticated, streamlined and secured delivery, as well as quicker playback capabilities for their media content. Ruckus Wireless announced the immediate availability of its new MediaFlex 7000 series, the first commercial 802.11n system specifically developed for operators to distribute multiple streams of HD IPTV content throughout a subscriber's home without costly and time-consuming cable installation. Belgacom is among the first service providers to select the MediaFlex 7000 for its BelgacomTV service, one of the most successful IPTV services with over 390,000 subscribers throughout Belgium. The Ruckus MediaFlex 7000 beat out competitive 802.11n products in a series of stringent lab and home trials conducted by Belgacom, including a test to deliver 20 hours of non-stop HD IPTV streams at 20Mbps aggregate, to six different locations throughout a simulated home environment with injected interference, without dropping a single packet. Research and Markets has announced the addition of the "Global - Digital Media - Broadband TV (IPTV) Overview" report to their offering. In only a few instances do we see an opportunity for IPTV - the reality is that the telcos will find it pretty tough competing with cable and pay TV operators. However, as PCCW has shown, it can be done. In 2008 there are initial global standards and architecture specifications in place. Interesting developments are taking place in Europe, particularly France and Italy; as well as China, Hong Kong and the Netherlands. We estimate there will be around 25 million users by 2010. While there is no doubt that broadband video, as we prefer to call it, will eventually become successful; we see it as an incremental service that can be added onto Next Generation Networks. This report includes BuddeComm’s analysis of the IPTV market, including VoD in relation to TV. The report includes brief case studies, statistics and forecasts. See separate report for information on video services over the Web. Opera Software has joined the Open IPTV Forum. This global organization is comprised of key IPTV and TV stakeholders working to produce end-to-end specifications to take the next generation of IPTV services into the mass market. As a part of the Forum, Opera will team up with other members, such as Samsung, Ericsson, Sony and Philips, to help create an end-user mass market for IPTV by developing specifications. These specifications will ease the creation, integration and deployment of compelling solutions and services. Frank N. Magid Associates and Metacafe release the survey results revealing consumer behavior and preferences in online video viewing. Notably, the survey found that the top-five most popular categories of videos watched online are all short-form: comedy, music videos, videos shot and uploaded by consumers, news stories and movie previews. The national study, conducted by Frank N. Magid Associates’ online research division SurveysOnline.com, surveyed nearly 2,000 people between the ages of 12 and 64 with gender, age and ethnicity representations matching those of the U.S. census. With competition heating up for video services in Europe, operators will employ VOD as a key differentiator in acquiring new subscribers, with evidence suggesting that the move from near-VOD to true VOD dramatically increases buy rates. VOD is fast becoming a must-have feature; and for those operators with the technology already in place, the next step is to differentiate even further via HD VOD, along with increasing the size of the content library. In a recent report, ABI Research categorizes the growth of VOD subscriber levels in the contexts of programming and functionality.